I have been sharing pictures of these bottle brush trees on instagram and have gotten lots of questions. You know what makes me crazy? Seeing a diy project that you know is diy but the maker won't share her secrets. Well, rest assured, I'll share all my not-so-secret secrets with you. I came across how to make these while browsing Pinterest (of course). I was looking at someone's Christmas board and I had made it all the way to the bottom when I saw the pin. I may have teared up a little. 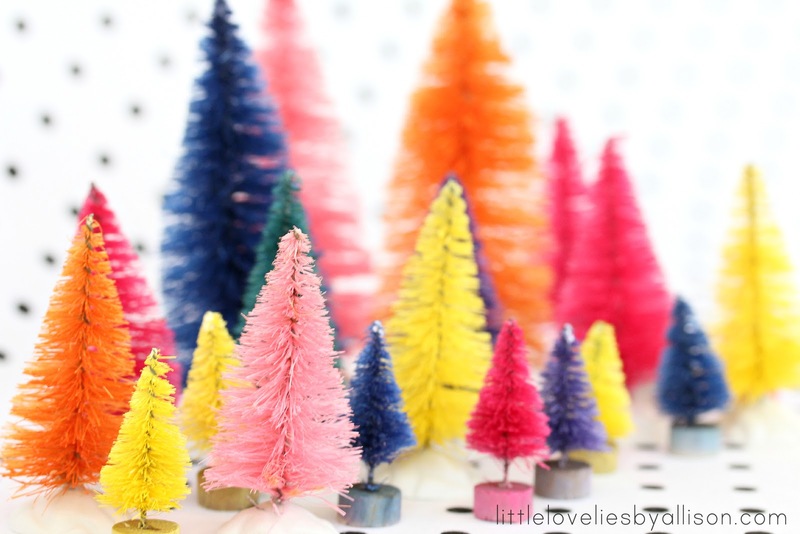 I've been trying to figure out where people were getting these colorful bottle brush trees at since last year. 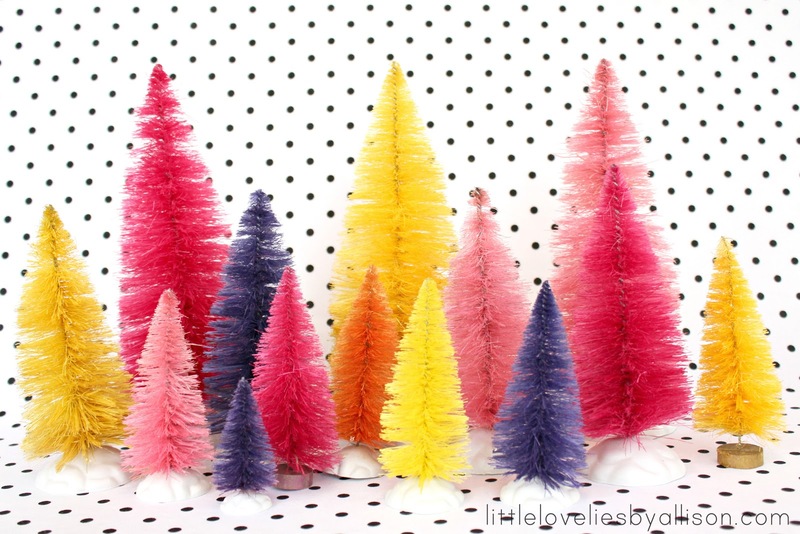 Of course if I would have just searched Pinterest for bottle brush trees I would have seen hundreds of links for how to make these. Oh well. I like my way of discovery better - it was like finding a lost treasure. 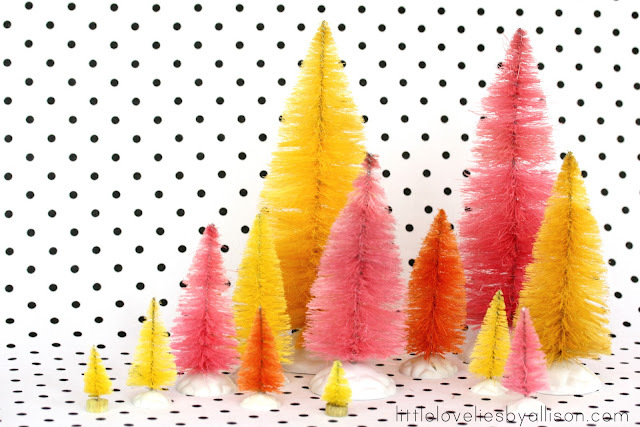 The bottle brush tree tutorial is from craftyminx. Since I don't want to steal someone else's genius, go over there to read all about it. I pretty much followed the tutorial exactly. I may have rushed a little and skipped washing the trees in soapy water. I'm a chronic craft rusher. I got my trees at Michael's in the Christmas village section. The original price was $21.99 for a large bag of them that has all different sizes. They were 40% off and I added another 20% off coupon on top of that which brought the price down to just around $10.00. Not too bad considering I have seen Tim Holtz trees for waaaay more than that. After my trees were all bleached and rinsed, I used Rit dye and mixed colors to get a variety of shades. To keep the color as concentrated as possible, I used a whole Rit dye packet in one mixing bowl of hot water. I let them soak for around a half hour so they would really take in the dye. For the lighter colors like yellow and light pink, I'm not sure this made too much of a difference. Those colors are already light so the extra time doesn't change too much. This has been one of my favorite Christmas projects ever. So much that I dyed two batches which means I have trees to last a lifetime. Did I leave anything out? Still have questions? Ask away - I'll do my best to answer them in the comments so everyone can see. What a timely post! These will look great on Olivia's birthday table, and I was going to start the search for table decorations this weekend. Now I know just what to get. Thanks, Allison! Ohh, this is so great! Your trees look awesome! Thanks so much for the fabulous and colorful inspiration!